How do I know I am singing Raag Dhanasri? Following the posting of a new shabad in Raag Dhanasri earlier this week (Ab Main Kaun Upao Karoon), I received a couple of inquiries on how to sing Dhanasri. 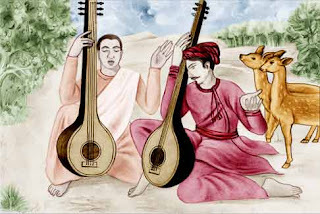 People often ask me about styles of singing, and especially definitions of several raags. And because I get these questions often, I think its appropriate to put the response on the blog. The request reminded me of my last lengthy discussion on Dhanasari -- which was memorable one. A few years ago one beautiful afternoon, after the normal Gurudwara program, I had the fortune of sitting with the gifted Bhai Gurmeet Singh Shaant and his jatha in the Norwalk Gurudwara in Connecticut, and we were sharing Dhanasari bandishes with each other; In his opinion this would be categorized as a Thumri in Dhanasari, not a Khayal, the more popular Kirtan style prevalent nowadays. The best way to learn the musical aspects of Dhanasri is to listen to accomplished musicians sing it. Please see a Compilation of Dhanasri Shabads for more examples of singing Dhanasri. If I stopped here, I would be wrong. The question is how do I know I am truly singing Dhanasri? Several musicologists will agree with the musical notes and other perfunctory intricacies, which are necessary, but still inept in creating the atmosphere of Dhanasri. I have found big and small encyclopedias of Indian classical music and Gurmat Sangeet fall short in a big way. The more you sing, Dhanasri, like all raags in my dear Guru Granth Sahib, it becomes harder to sing. The musical rules are the first step and maybe easy for an adept musician, but that is only the tip of the iceberg; the true Dhanasri, like any true raag, has to fortify the meaning of the words we are singing. That is the purpose of any raag. Raag Dhanasari, in my experience is the extrovert cousin of Raag Sri, although you will not find any similaries in the notes. I have heard some experts claim that Dhanasri comes from two words: Dhan and Aishwarya, both dealing with wealth. Raag Dhanasri, as I have come to discover, has to reminds us that Sri is Dhan, that God is Great, He is the true wealth; not temporarily, incessantly so! In song Dhanasri becomes an incessant celebration of the Greatness of God! And one also has to remember that for a thiest, a synonym of "God is Great" is "I am fortunate." Let me explain. If you want to really learn what Dhanasri truly is, and why Sri is Dhan, there are no better better teacher than the Guru Granth Sahib ... than Guru Nanak, or Guru Arjan, or Guru Tegh Bahadur. I know I am singing the Dhanasri which my dear Guru Nanak sang when in astonishment in gazing at the stars I feel the magnimity of our Creator who has studded the sky with stars, those innumberable candles in the platter of the sky. When I get out of my office in the late evening and open the door to smell the jasmine surrounding my office, Dhanasri plays a video of Guru Nanak's walk through sandalwoods. Dhanasri's is a melody with a persistant fragrance, a persistant reminder. And by the conclusion of my dear Guru Nanak's Aarti the fragrant reminder lights my heart with the candle that lights everyone else. Even if you stopped here, it is clear that there is no better way to adorn God than the sights and smells conjured by Dhanasri. Dhanasri comes as a blessing when you feel that Guru Arjan singing with you ... a blessing by the Great one, whose power extends in all four directions, Chatur disa! The true wealth of Dhanasri does not stop at the shear magnificance of the proportion of His Creation, but it resides in the Love that He shares with insignificant beings. Even when this shabad is sung not from its rahao tuk, and not in the correct raag ... take "Jo Mange Thakur Apne te," in the famous Pahadi tune that everyone knows ... the glow of Dhanasri is resplendent in moments when God's will is so well inculcated in oneself, that one receives whatever one asks for! Whatever! Soi soi deveh! How Great is our Creator to have created innumerable amenities, and then provided us, lowly beings with these as gifts. The candle of true love shines even for me, a nobody in stark contrast with the rest of Creation. My dear Guru Arjan reminds me that I am quite inept ... I have only one tongue, how can I sing praises of the infinite ... kavan gun kahiye? Still You like my father take care of me. Even my dear Guru Tegh Bahadur reminds me of my ineptness, of my spending life on worthless pursuits in the aforementioned shabad I have grown to love - Ab Main Kaun Upao Karoon (See http://www.reverbnation.com/singh ). In conclusion of "Ab Main Kaun Upao kAroon" Guru ji gives you a concise answer about Greatness and true wealth of Dhanasri: The closer I get to realizing that I cannot comprehend the awesomeness of God, the essence of Mool Mantra, even a lowly sinner like me, who is removed from pure thoughts, pure words, and pure action, can be saved by His mercy! That is His awesomeness -- His powers are Great, qualities innumberable, nevertheless He is merciful and unconditionally loves me like my father. That is why Sri is Dhan, and thats what we celebrate in Dhanasri. O Destroyer of fear, this is Your Aartee, Your worship service. Whatever the Lord's slave Nanak utters with his mouth, proves to be true, here and hereafter. Gazing upon me with his Eye of Mercy, He has dispelled the pains of His slave. my Master, my Husband Lord. and teach me in so many ways. I am so ignorant - I understand nothing at all. I seek Your Sanctuary - You are my only hope. You are my companion, and my best friend. How can I dispel the anxieties of my mind? I have done no good deeds; this makes me very afraid! like a beast, I fill my belly. for only then can I, the sinner, be saved. Thank you very much. It's very helpful.